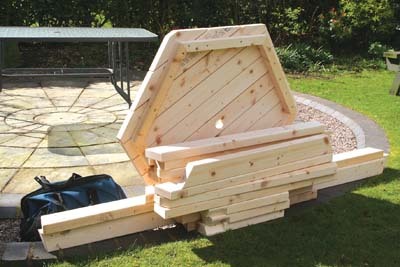 This is a great outdoor project that will only take a couple of days to build, and will bring hours of pleasure to your summer alfresco dining experiences! Despite its simple appearance, quite a lot of thought went into the design process, as I had a number of criteria to fulfil, while trying not to make the job too complicated. 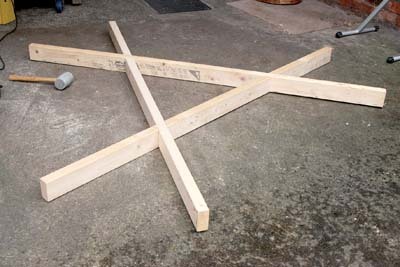 For a start, I wanted to avoid the standard 'A' frame style that is commonly used in every pub beer garden and picnic area the world over. Although a well tried and tested design, my issue with it is that you have to 'thread' yourself through it onto a seat - not ideal for your older guests. 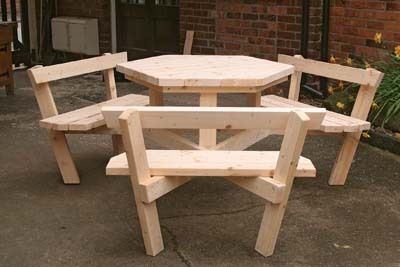 Secondly, I wanted a table that has wheelchair access for a friend of mine, rather than have him stuck sideways on the end of a conventional picnic table. 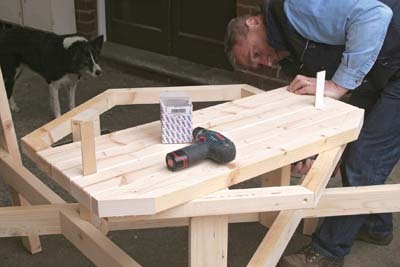 Thirdly, the table had to be quick and easy to dismantle so it could be put away during the winter and, fourthly, it had to be made within a budget of Â£60, using standard off-the-shelf material and minimal power tools. With all this in mind, and after some extensive internet research, I settled on a hexagonal design with three double seats that are easily accessible from either side. 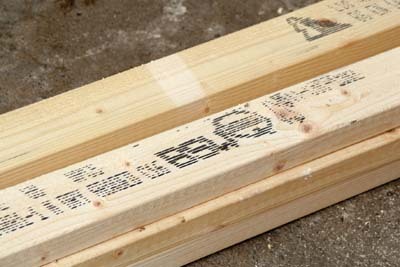 For the material, I used 95 x 46mm carcassing timber which is relatively cheap, and although not finished to the standard of PAR material, is certainly a lot smoother than rough sawn. 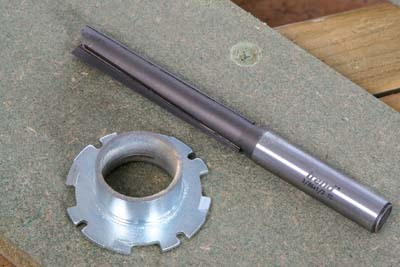 It also has the corners machined to a smooth radius, which makes the finished project a lot more user-friendly, with a minimum of work. 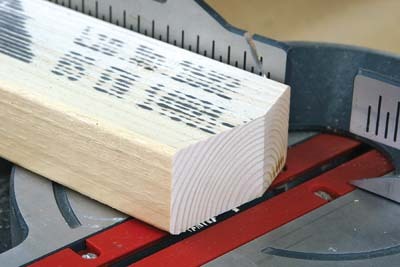 an issue, but if you anticipate using a clear finish then either sand off the printing, or feed each piece through a thicknesser, taking off just a very light pass. 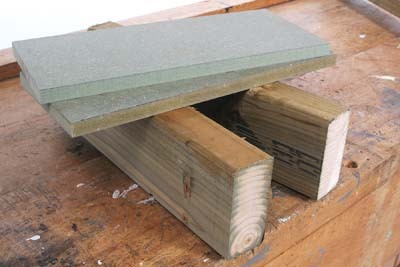 There is also a tanalised option for extra durability, but this is considerably more expensive. 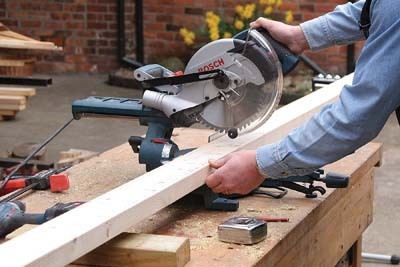 As the basic shape of the table is hexagonal, you need to make a lot of angled cuts, so a mitre saw is almost essential but before you start, make a trial cut to check that the angle is spot on and the cut is square. 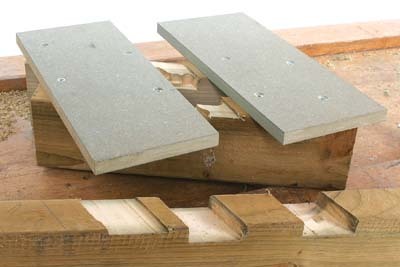 To minimise waste, I bought 4.2m lengths of material which are quite awkward to handle on your own, but a roller stand or trestle will make the sawing process easier and also safer. 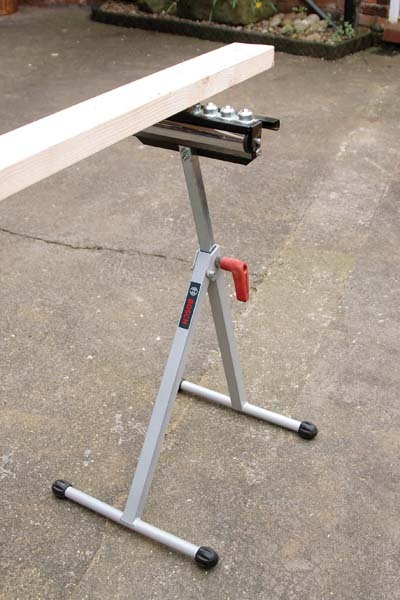 Roller stands are like a third hand in the workshop and to my mind, are worth their weight in gold, particularly the ball type. 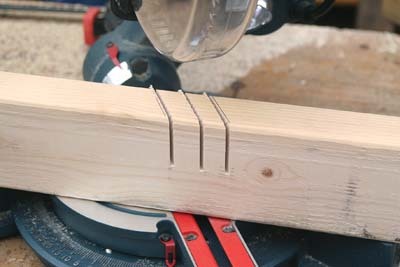 a very simple template jig to use with a long straight cutter and a guidebush in the router. 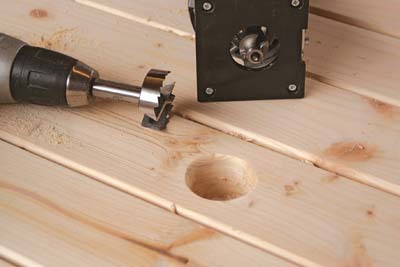 It would be very messy and time-consuming to rout out the whole joint so with the trenching stop on your mitre saw set up for depth, cut to within a couple of millimetres of the marked joint. 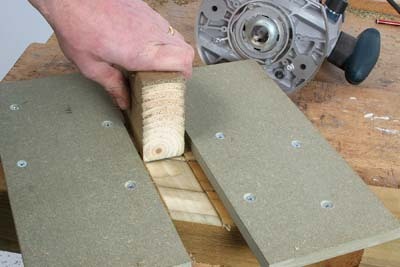 Use a chisel to knock out the majority of the waste, taking care not to split the waste off too deep. 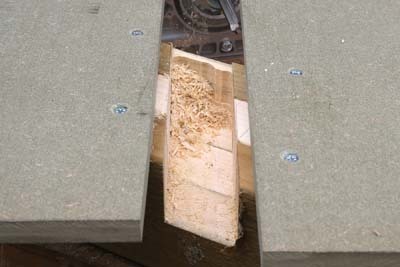 Using a scrap of the actual workpiece material as a spacer, screw the first piece of MDF across the two jig components at the required 60 degree angle. 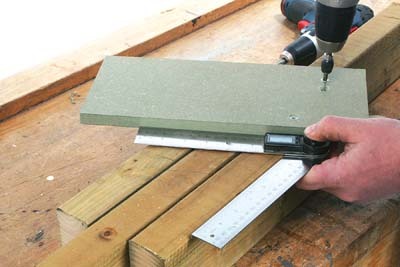 You need to calculate the distance between the two MDF guide strips, and for this you need to work out the guidebush margin (gbm) which depends on the relative diameters of the cutter and guidebush you're using. 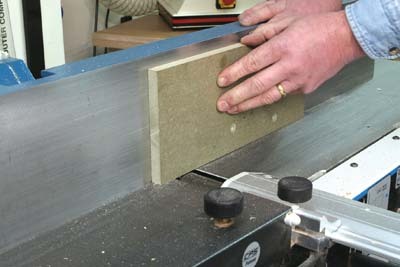 Then clamp the router jig in place and machine out the joint to the perfect width and depth. 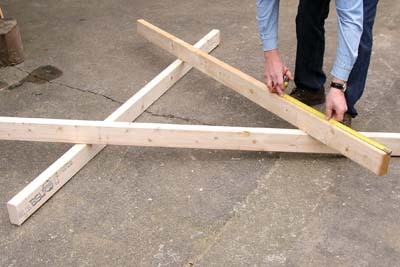 The triangle frame should now fit together, requiring just a light tap with a rubber mallet to seat the joints properly. 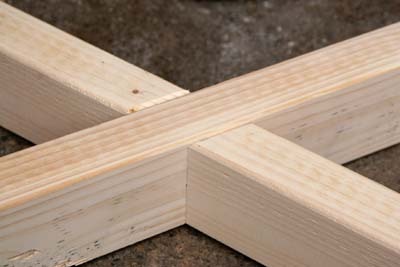 For the sake of neatness, I used a small rounding over bit in the router to radius the cut edges of the joint to match the existing edge profile. 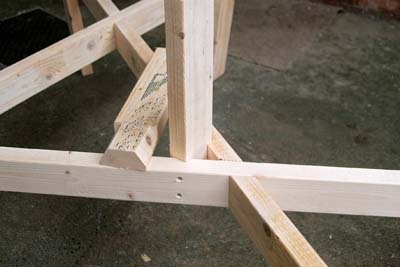 The six legs can now be cut to length with the 15° angle on one end to produce the necessary inclination. 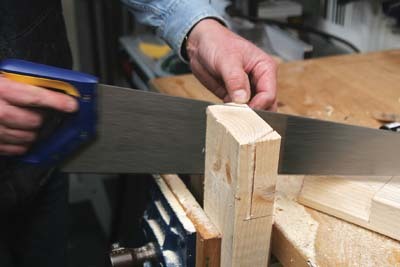 I could have cut this same angle on the top end of each leg as well, but thought a double angle would look neater. 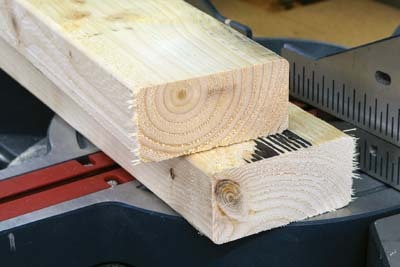 All cut ends and edges are radiused to match the long edges and for jobs like this, I love using my Bosch palm router, which is so light and manoeuvrable. Although I did not require a super smooth finish, a quick brush over using a random orbit sander with a 120 grit disc made a huge difference to both the feel and appearance of the timber, which was worth doing. Now you can start the assembly, which is initially quite tricky if you are working on your own, but I used a combination of paint tins and blocks to hold the main frame level while screwing on the legs. 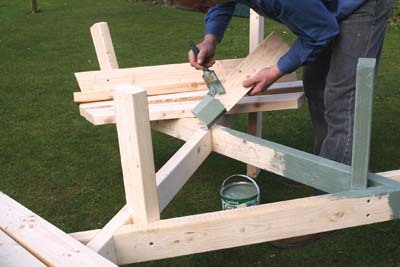 Use a spacer to ensure that each cross rail is fixed at the right height on each leg. Ithink it always looks neater in this situation if you deliberately overlap the pieces to be joined, rather than try and get them flush, but this is a matter of personal opinion - decide which you think looks best for yourself. 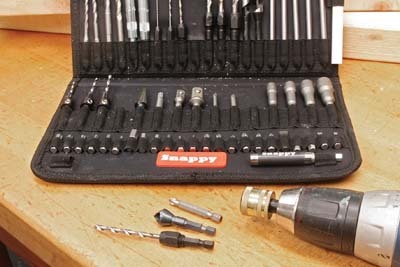 Another good tip, particularly if you only have one drill and are drilling, countersinking and screwdriving in quick succession, is to use a quick change chuck system such as the Trend Snappy. 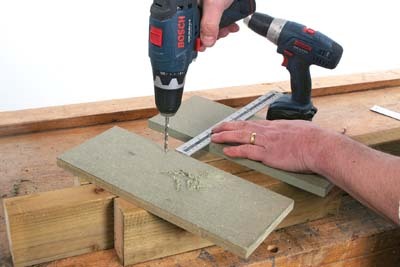 This allows you to make very quick changes to the drill set up and will recoup its costs in no time. 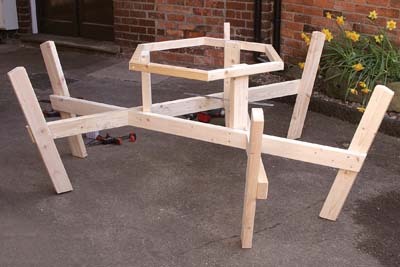 The basic frame soon took shape, a process made so much easier if you have a perfectly flat surface to work on. If not, use wedges under each leg to avoid introducing distortions. 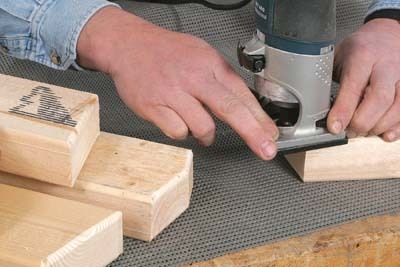 The table upright supports require some careful shaping to be a close fit in each apex. 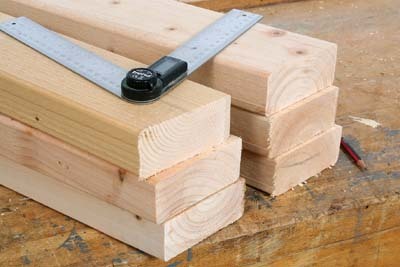 Try as I might, I could not think of a way of doing this using a machine or power tool, so instead, I resorted to cutting them by hand. 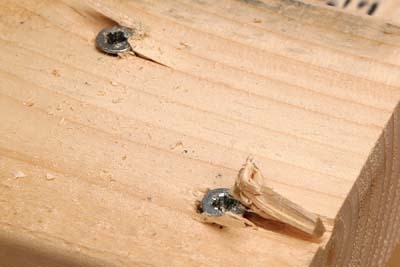 The uprights are then again just screwed in place - I used two screws from one side of the joint and one from the other. 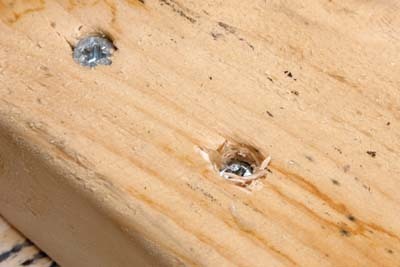 The tabletop frame is made from the same material but ripped down the middle - a single screw is enough to hold each corner joint as it all stiffens up when you fix on the top boards. 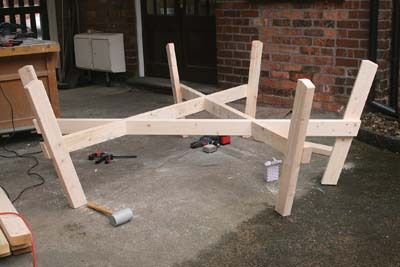 So thatâ€™s the framework complete and now it just requires covering to form the seats and tabletop. To make the whole thing appear lighter, I reduced the rest of the material down to 40mm, which is still plenty strong enough but stopped it all looking too chunky. 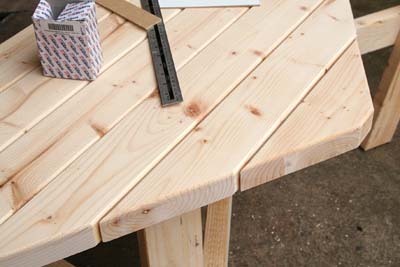 The slats for the table are screwed through from the underside using hardboard spacers to maintain an even gap. 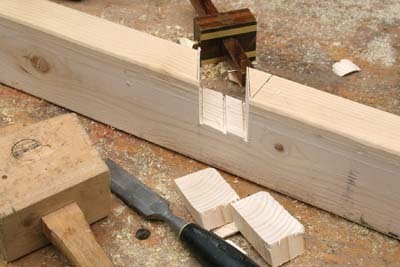 Where possible, screw through into one slat from either side of a frame joint to increase its rigidity. 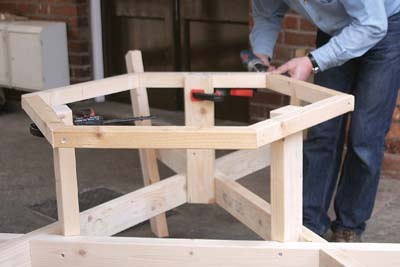 The challenge is to ensure that the smallest part of the hexagon top is still big enough to get a secure fixing onto the frame. 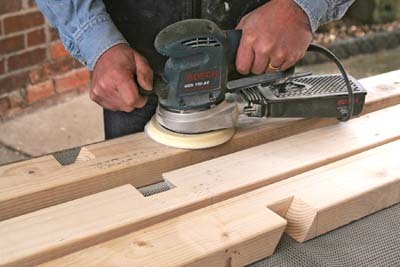 With the top complete, radius all the edges as before, and then give it a thorough sanding, as the timber is not the best quality and does feature some quite large knots and areas of torn grain. 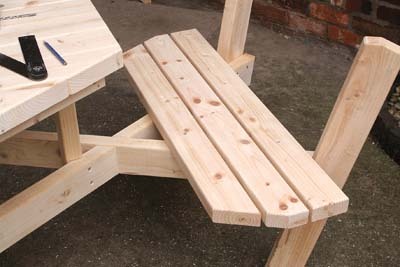 The seat is made from three slats fixed from the top, with angled ends to make it easier to walk in and sit down. 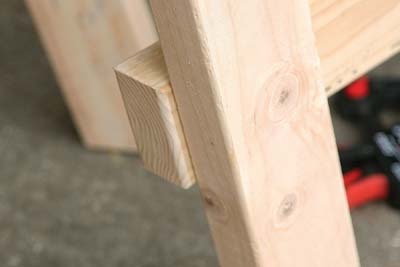 The back is just a single slat screwed onto the angle of the legs. I did consider letting this in to produce a bigger bearing surface but in reality, just a single screw through the arris of each leg seemed to be quite sufficient. 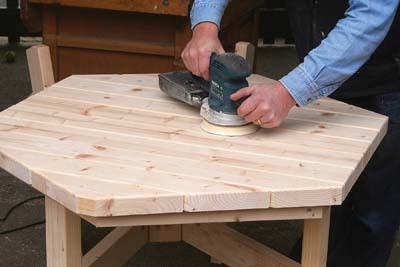 If you anticipate using a parasol, drill a suitably sized hole in the middle of the table and then again, use your router to radius the top edge for a neater appearance. 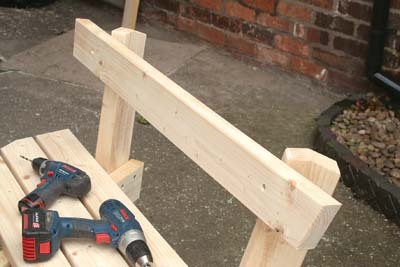 The completed bench. It took me about 12 hours to get to this stage, and what had been a rough sketch with approximate dimensions, actually worked out quite well! I was particularly pleased that the seat arrangement still allowed easy wheelchair access as required in the original brief. Now it was just a question of dismantling and reassembling on-site. 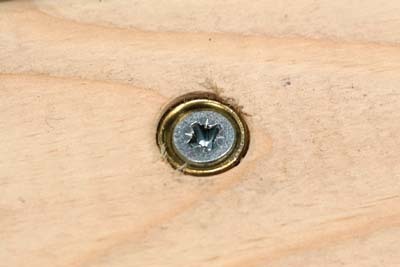 It only took about 10 minutes with my drill driver to reduce the bench to its component parts. 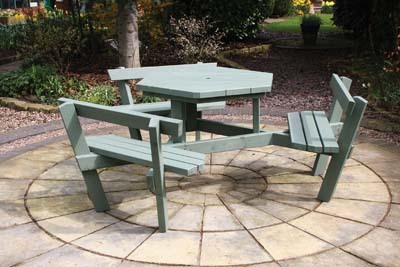 To finish, I used a coloured preservative which I've always found to withstand the weather well, even in direct sunlight. 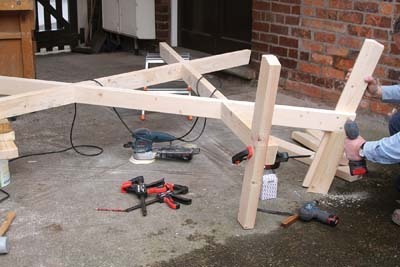 Apply this is as you reassemble the bench, so that all the joint surfaces can be covered as well.